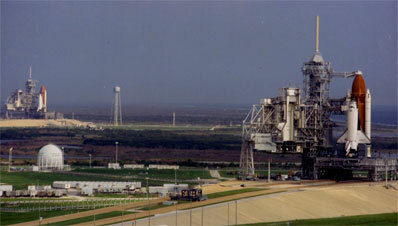 Over the history of NASA's space shuttle program, it has been a rarity for both launch pads at Complex 39 to be occupied at the same time. When space shuttle Endeavour moves to pad 39B on Friday to begin its role as a rescue vehicle for Atlantis' mission to the service the Hubble Space Telescope, it will mark just the 19th time that two flight-ready orbiters will be standing on the dual seaside pads. An even more seldem event is two orbiters being fully visible on the launch pads simultaneously. A famous photo illustrating the view to behold when both rotating service gantries are opened to expose the orbiters can be seen above.